When a child has convulsion he is likely to become stiff; sometimes they may begin to jerk, and then become unconscious. The eyes are likely to roll back and go into the head. Convulsions which are as well referred to as fits, seizures or epileptic attacks, can be caused by a number of factors. Amongst the different types of seizures are the two very important ones – epileptic seizure and febrile seizure. But we shall be dealing more with Febrile Seizures in this article. Febrile seizures, also referred to as convulsions are febrile reactions caused by an allergen; this type of reaction can occur when a young child is down with a fever that is reading above 38°C (100.4°F). Thus when a child is febrile, it means he is having a feverish condition. Usually when the child begins to convulse as a result (of a sudden rise in temperature), the seizure will go on just for a few minutes and then cease on their own, and the fever is also likely to go on for some time. According to medical experts at the world renowned Mayo Clinic, “Febrile seizures occur in children with normal development; …most febrile seizures stop on their own within a couple of minutes.” In as much as convulsions due to feverish condition can appear serious, it is bound to stop even if it is not treated, and it’s not also going to trigger any other health issues. Some children might be caused to fall asleep after having a seizure while in some others the case may be different, without any long term reactions. What You Can Do During a Convulsion Ensure first of all that you are calm and do not panic. Then lay the child on a soft surface; make him lie on his side to prevent choking. Then observe carefully to know precisely what takes place. This is to enable you describe it to your doctor afterwards. You may as well make use of a smartphone or camera to take a video of the seizure, if you can. But if the convulsion persists for a ‘long’ time such as more than 5 minutes, take your child to see the doctor without much waste of time. But very importantly, you can help to reduce the temperature and make the kid feel a little more comfortable by removing any extra clothing on him especially around the head and neck areas. In addition to the above measures, ensure to remove any nearby objects that might lead to injury to the child, while looking out to see if the child has difficulty breathing or if the face is changing colour. Avoid the temptation to hold or restrain the convulsing child. Avoid inserting anything in your child's mouth, as many Nigerians are wont to do the opposite. 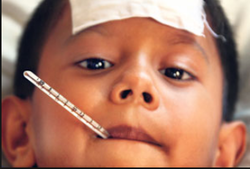 Avoid administering any ‘anti-fever’ medicine to your child. Avoid dipping the young child in cool or lukewarm water in a bid to calm his temperature. Prevention In order to prevent convulsions that are not due to fever however, would rely so much on the diagnosis of what could have been responsible for the seizures. Experts note also that there is no reason to give your child any medicine for the sake of attacking the seizure when the child develops a fever. This is for the reason that a good number of days would be needed before the drug can begin to gather enough strength to avert convulsions.